Originally published under the title "Could This Extremist New Jersey Imam Be Deported?" In a December 8 sermon, Aymen Elkasaby called Jews "apes and pigs" and urged his congregation to "count them one by one, and kill them down to the very last one. Do not leave a single one on the face of the Earth." Aymen Elkasaby, the extremist imam at a New Jersey mosque (now suspended) who called for genocide against the Jews in a December 8th sermon, appears to be in America on a temporary work visa. Elkasaby repaid the American hospitality he received by calling on all Muslims to engage in violence against Jews, as a religious obligation. And this was not his only foray into frothing bigotry. 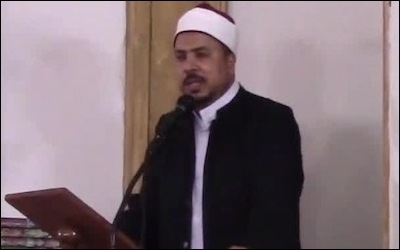 In a November sermon, newly translated by the Middle East Media Research Institute (MEMRI), Elkasaby peddled a bizarre conspiracy theory that Jews were responsible for a deadly terror attack in Egypt, rather than ISIS. America has enough problems with homegrown extremism; we hardly need to import more extremists from abroad — and particularly not to place them in positions of authority. America has enough problems with homegrown extremism; we hardly need to import more from abroad. According to government sources who spoke to the Middle East Forum, Elkasaby's employer — the Islamic Center of Jersey City (ICJC) — applied for a non-immigrant worker visa in 2016, presumably a religious-worker visa (R-1). The first ICJC video featuring Elkasaby (which has since been taken down, along with all of Elkasaby's other sermons) was posted in August 2017 — a year after ICJC submitted its application. The head imam there, Farghal Ali, has been at ICJC for some time, making it highly likely that the visa application was for Elkasaby, who is the only other imam employed by the ICJC. 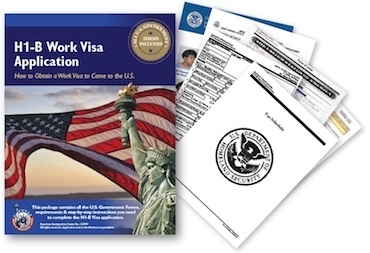 The R-1 visa program has long been a favored tool for fraudulent entry into the United States. The R-1 visa program has a troubled history. Begun in 1990 to help the Catholic Church address a shortage of American clergy, the program has been a favored tool for fraudulent entry into the United States almost from the beginning. In 1999, the then-named General Accounting Office (GAO) warned that fraud was rife and uncontrolled in the R-1 visa program. In 2006, US Citizenship and Immigration Services (USCIS) determined that about 33% of R-1 applications were fraudulent. Sheikh Omar Abdel Rahman, the "Blind Sheikh" who masterminded the 1993 bombing of the World Trade Center, came to the United States on an R-1 religious-worker visa. So did several employees of the Holy Land Foundation (HLF) and the Islamic Association for Palestine (IAP), both of which were front organizations for the terrorist group Hamas. Counter-terrorism experts have recently called for the R-1 program to be reformed, saying that it poses a grave national security risk. 1993 World Trade Center bombing mastermind Omar Abdel Rahman (left) arrived in the U.S. on an R-1 visa. 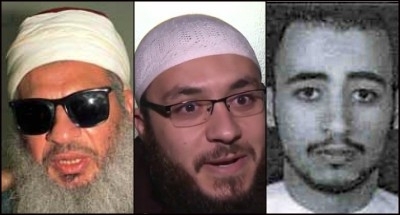 Imam Ammar Shahin (center) and 9/11 hijacker Hani Hasan Hanjour (right) arrived on student visas. One of the 9/11 hijackers, Hani Hasan Hanjour, was also here on a student visa, yet never attended school; three other 9/11 attackers had illegally overstayed their tourist visas at the time of the assault. For many years now, watchdogs have been decrying the ease with which both violent and nonviolent extremists have enjoyed the hospitality of the United States — sometimes illegally, but often simply by taking advantage of legal visa programs. Yet the Trump administration's attempts to address this issue — partly through "extreme vetting" policies — have been condemned as racist, or discriminatory against immigrants. Such criticisms are beside the point. US law already sets forth that non-citizens may be deported for supporting terrorism and extremist violence. "Extreme vetting" is about giving these provisions teeth, and enforcing the law to protect the American people. Keeping out extremist imams will serve to protect Muslim communities from radicalization. Far from being discriminatory against Muslims, keeping out extremist imams will serve to protect Muslim communities from radicalization, and from tarnishing the name of Islam. Mosques seeking to hire imams should know that the US government will help them avoid the tragedy of importing cancerous hatreds from abroad. "Extreme vetting" is a necessary tool to help accomplish this. Meanwhile, if Elkasaby is in America on a temporary work visa, then that privilege can and ought to be revoked. Instead, an imam who can represent what is best about Islam within a pluralist society should be hired in his place. Oren Litwin is a research fellow at Islamist Watch, a project of the Middle East Forum.